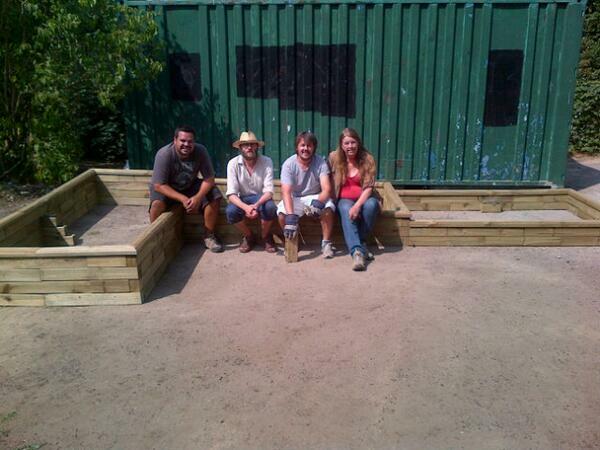 We’ve raised the beds – next we raise the veg! Volunteers from the Bridge and Pip! 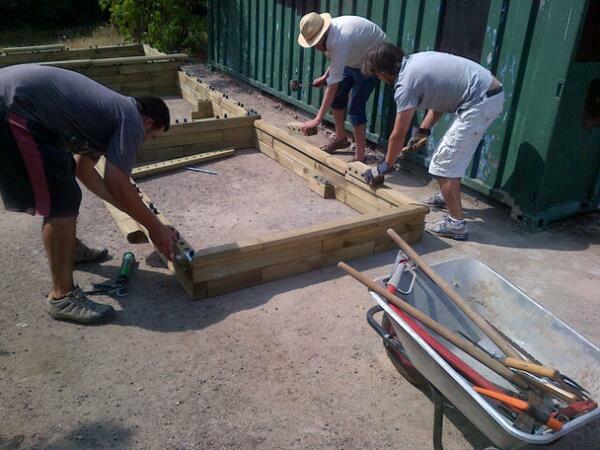 endured sweltering sun this week while constructing wooden raised beds to get our food-growing club running. Thanks to everyone who contributed to the dowel-bashing, malleting, gluing, hefting, carrying, perspiring and general collective problem-solving and instruction-interpreting. And thanks to Stephen Brain, for collecting the evidence of the hard work on camera. Thanks also to those who turned up on the first scheduled day when the delivery of the blocks meant we had to postpone. And huge thanks also for Sue Gay’s time and effort bringing gravel, horticultural fabric and compost today – a huge task. The materials for the beds were donated by Mace, the contractors building the new Greenwich Square development – and we were really pleased with how attractive they turned out to be. They’ve already made a big difference to what was a derelict-looking patch of hardstanding – and once the beds are sprouting and blooming it’s sure to be really beautiful. We aim to use the beds to help the children (and grown-ups) who come to the Bridge’s play-and-stay sessions to learn about food-growing and healthy eating and to excite them about trying vegetables and fruit that they might otherwise turn their noses up at. Growing your own food can have a great effect on children’s willingness to try new flavours. If you weren’t able to be there, there are still ways you can help – there is a list of materials that would really help to launch our kids’ growing club – scroll to the bottom of this earlier post to see if there’s anything that you might be able to donate, including food-growing knowledge. We were also really pleased to be approached by Paul and Nala from Avant Gardening this week, who are looking for partners for their plans to get people in Greenwich excited about food – ideas include flavouring ice cream with wacky vegetable flavours and riding a cycle-powered ice cream maker around the area, among other brilliant ideas. Next they’ll be applying for funding to make their plans a reality, and we hope to be involved. Watch this space.